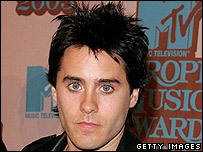 Lindsay Lohan and Jared Leto are to star in an independent film set around the murder of John Lennon 25 years ago. Chapter 27, which will be shot in New York in January, is being described as a "psychological study" of the former Beatle's killer Mark Chapman. Lohan, last seen in Herbie: Fully Loaded, will take on a fictional role of a Lennon fan who befriends Chapman, played by Lord of War actor Leto. The parts of Lennon and his wife Yoko Ono have not yet been cast. Lennon was shot dead outside his Manhattan home in December 1980. Chapman, who is still serving a prison sentence for the killing, had got the musician to autograph a copy of his newly released album Double Fantasy just hours earlier. Producers said Lennon himself would have a relatively small screen presence in Chapter 27. Lohan's character was created to help film-makers explore the motivation behind the killing, they added. The film is the first project from director Jarrett Schaeffer, who also wrote the script. It is being co-produced by Toronto-based Peace Arch Entertainment and 21 Grams film-maker Robert Salerno's company Artina Films. "It's a psychological study," said Peace Arch's John Flock. "I wouldn't call it a sympathetic portrayal of him, but you do kind of get into Chapman's head." The film's title is said to be a reference to the 26 chapters in the JD Salinger novel The Catcher in the Rye, which Chapman said was an inspiration for the murder.